The taste of grilled chicken blended with a succulent juice overtop has a distinct flavour your small dog can't get enough of. This pâté-style grilled chicken flavoured loaf provides complete, balanced nutrition and a source of moisture that can be beneficial to small dogs. Gram-for-gram, wet foods like the CESAR® brand have fewer calories than dry food. Paired with CESAR® Dry food, the 100g serving makes a perfect meal for small dogs. 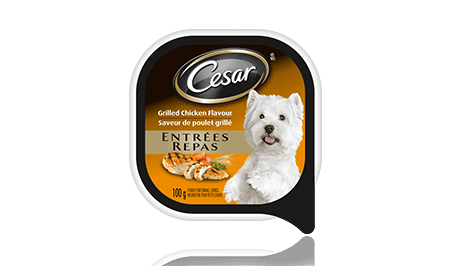 CESAR® ENTRÉES: GRILLED CHICKEN FLAVOUR 100g is rated 4.4 out of 5 by 61. Rated 4 out of 5 by LINDARAB_3591172634 from This is a wet dog food. My dog has always been fed a dry dog food (along with a few table scraps . She showed no interest in even tasting the food, let alone eating it. But then again, she has always been a very picky eater. I have wasted a lot of money buying dog treats that she has also turned her nose up at without even putting in her mouth. She seems to either really love food/treats or really hates them. Maybe it has to pass her nose test before it gets a chance at the taste test. Rated 5 out of 5 by WILLILON_3591160028 from I usually mix cooked stewing beef, rice and kibble for my dog because 1. he likes it and 2. It is good for him. The Caesar food was a great change and i used it instead of the stewing beef - and he ate it right up meaning I think he really liked it. I plan on keeping some Caesar in stock for times when I run out out cooked stewing beef or just to change things up. Rated 5 out of 5 by TERRYWNS_3591162132 from I have a little dog who I cook her food for as she refuses to eat any hard dog food and has got sick off of many of the can dog food. this is the only food that I have opened, placed in her dish that she has eaten and had no side effects. it is such a great relief to find a product that she enjoys and that I can feed her with out any complications. Rated 5 out of 5 by SOPHIEMNB_3591163417 from My dog had never really ate wet dog food so at first she smelled it, then licked it, then she devoured! She loved it ! I found it easy to use as it is just a peel off cover and the price was very decent. I personally prefer to give dry pet food but it makes for a nice treat once in a while. Rated 5 out of 5 by KRYSTLEBON_3591158667 from My dog is not a very picky eater. She loved the ceaser entree much more than kibble though. I'm not going to lie, it smells and looks pretty appetizing, even as a human. My dog is a larger breed, so this was just a treat, but she ate every last drop and licked the dish clean. Rated 4 out of 5 by LAURAJBC_3591156134 from We're very sure that only the change of flavour from her regular type and having something different introduced will take just a bit longer for our dog to get excited. It's summer and the heat and humidity has changed her eating patterns so hard to give a more accurate review. Rated 5 out of 5 by JMEMON_3591173106 from Oliver was excited. He knew right away that he was getting something different. I was surprised to see the pieces of chicken and the vegetables. Oliver really enjoyed his dinner. I am going to buy it for him from now on. CESAR® Entrées Grilled Chicken Flavour Food For Small Dogs is formulated to meet the nutritional levels established by the AAFCO Dog Food Nutrient Profiles for maintenance.